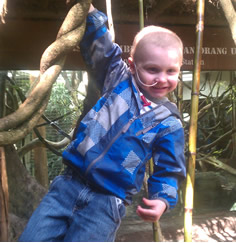 Porter was only three years old when he was diagnosed with Wilms Tumor, a rare kidney cancer. Porter had Stage III cancer and his tumor ruptured, causing it to spread throughout his entire body. After ten trips to the operating room and lots of chemotherapy, the tumor was not responding to any treatment. It grew to the size of a watermelon and was taking over Porter's body. He was very ill, and as his mother, Marissa, explains, "we almost lost our son more times than any parent should ever have to experience." Because the family spent every night in the hospital with Porter since his diagnosis, it has become difficult to live life in the same way. The NCCS has helped Porter and his family pay their bills while he is receiving treatment. Porter's parents describe him as their hero and miracle child. "Porter still has a long road but is doing amazing. We will continue to fight and remain positive," says Marissa. "NCCS helped us in a crucial time to help pay bills. It is because of organizations such as NCCS that families can have some solace in knowing there is indeed help. God bless this organization!!"